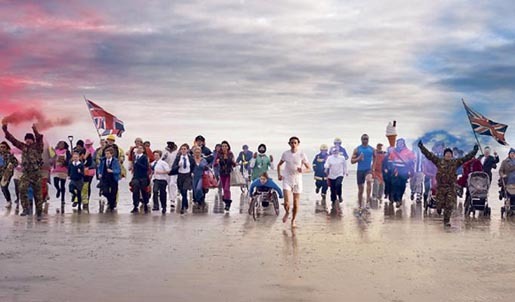 British newspaper The Sun is running an advertising campaign marking the year of the 2012 Olympics, centred around a television commercial inspired by the Chariots of Fire film. Actor Nigel Havers, who played Lord Andrew Lindsay in Chariots of Fire, is shown sitting on a beach deckchair reading The Sun while the great British public run past in slow motion accompanied by Vangelis theme tune. The Sun is encouraging readers to film themselves carrying out tasks in slow motion. An app on The Sun’s Facebook page will automatically overdub the movie’s music and the best clips will be shown on the paper’s website. The Olympics campaign was developed at WCRS, London, by creative director Billy Faithfull and Ross Neil, creatives Rich Littler and Zac Ellis, agency producer Jane Bessey, account team Mike Stern and Will Hunt. Filming was shot by director Guy Manwaring via Sonny London, with producer Lindsay Turnham. Editor was Mark Edinoff at The Quarry. Post production was done at Golden Square. Audio post production was done at Angell Sound. Social media was handled at Jam (Engine).